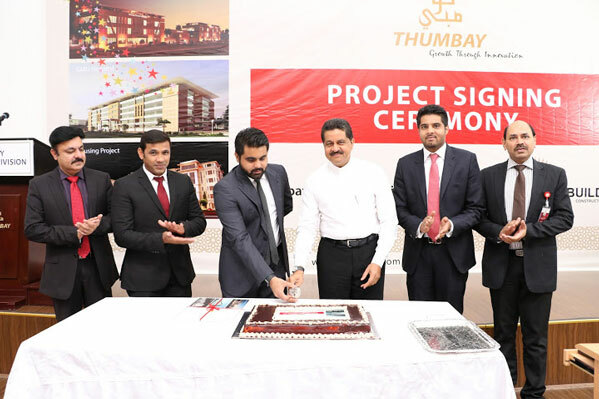 Thumbay Builders, the high-end general construction company operated by the Construction & Renovation Division of Thumbay Group will construct several major projects coming up under Thumbay Group, which will go a long way in adding to the facilities of its Gulf Medical University (GMU), and expand its healthcare facilities. An agreement to this effect was signed between Thumbay Builders and Thumbay Healthcare Division at 11:00 am on Monday, 23rd May 2016 at GMU, Al Jurf – Ajman. 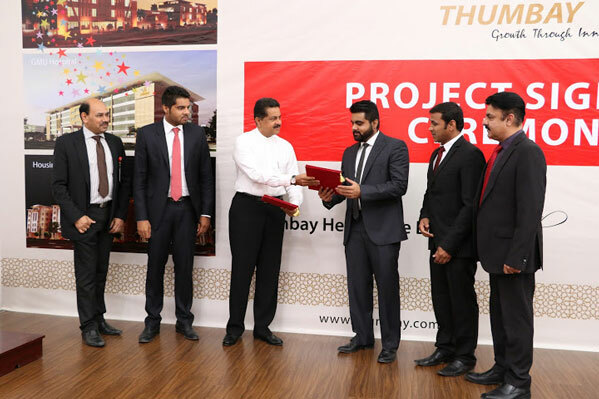 The signing ceremony was held in the presence of Mr. Thumbay Moideen – Founder President of Thumbay Group, Mr. Akbar Moideen Thumbay – Vice President of the Healthcare Division of Thumbay Group, Mr. Nazeer Hussain – Director Finance & Budget of Thumbay Group, Mr. Akram Moideen Thumbay – Director Operations – Construction & Renovation Division of Thumbay Group, Mr. Farwaz – Director Operations of Thumbay Builders, Mr. Asher Jahangir – Assistant Director Facility Management of Thumbay Group and other members of the administrative team of the group. The upcoming projects include a Thumbay Hospital with 300-plus beds which will be constructed over an area of 3,56,000 sq. ft., a Dental Hospital with 60 chairs over an area of 37,000 sq. ft. and a Rehabilitation Center to be constructed over 27,000, all within the GMU campus and expected to be completed in 15 months. The hospital, once complete, will be the biggest private academic hospital in the Middle East region. “With these projects, Thumbay Group will cement its position as the largest private academic healthcare provider in the region. 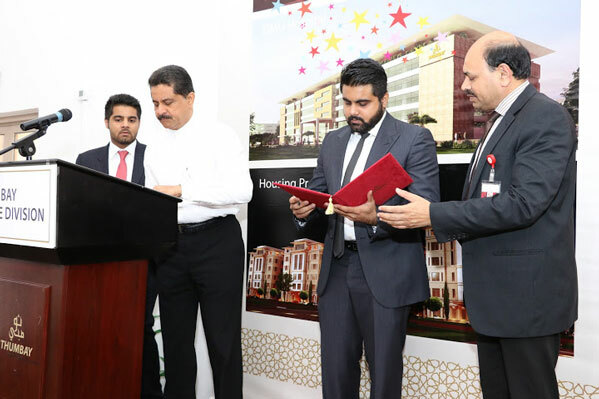 In addition to being the teaching hospital of Gulf Medical University, the new hospital will have ultramodern facilities, and will uphold Thumbay Group’s tradition of providing high quality healthcare services at affordable costs,” said Mr. Thumbay Moideen. Also, a Housing Project which includes a hotel, separate hostels for boys and girls and staff accommodation over an area of 7,60,000 sq. ft. is expected to be complete in 2 years. The housing project will provide campus living facilities for students and faculty of GMU, and it will have studio, one-bedroom and two-bedroom furnished apartments. An office tower to be built over 35,000 sq. ft. and a 25,000 sq. ft. hospitality project incorporating The Terrace Restaurant, Body & Soul Health Club & Spa and Blends & Brews Coffee Shoppe are other upcoming projects in the GMU campus, expected to be completed in 9 months. In addition, Thumbay Builders will also be involved in the 1,00,000 sq. ft. expansion project at Thumbay Hospital – Dubai, expansion the hospital’s Out Patient Department (15,000) sq. ft. and the construction of Thumbay Head Office, over 40,000 sq. ft. These projects are to be completed in 1.5 years. The total area of the projects add up to around 1.4 million sq. ft. and is estimated to be completed at a total cost of around AED. 600 million. Mr. Akram Moideen Thumbay, Director Operations – Construction & Renovation Division of Thumbay Group said that Thumbay Builders was all set to start the projects and complete them as per schedule. “Thumbay Builders is proud to partner the Group’s new projects which would redraw the healthcare map of the region,” he said. Thumbay Builders has extensive construction projects in India, and an impressive client list in the Emirates. It is one of the largest construction companies in the Northern Emirates of the UAE. It offers facilities in designing, developing and constructing real estate. Some of the prestigious projects handled by Thumbay Builders include the Gulf Medical University, Thumbay Hospital, Thumbay Pharmacy, Body & Soul Health Club, Blends & Brews Coffee Shop and Terrace Restaurant.